Defence-Blog.com has posted photographs of the new Leopard 2RI main battle tank (MBT) for the Indonesian Army. The Leopard 2RI (Republic Indonesia) is a version of the Leopard 2A4 MBT upgraded by Rheinmetall with parts of their Revolution package. 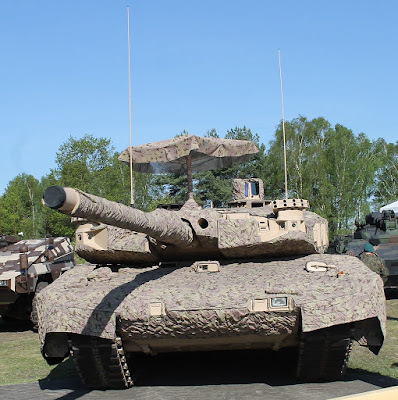 The first prototype of the Leopard 2RI was presented at Eurosatory 2014, but the final configuration has still changed after. It seems that the ROSY smoke screen system has not been adopted and a different types of headlights and driver night vision camera have been chosen for the final configuration. Another change comapred to the older configuration might be made to the hull - the current Leopard 2RI appears to lack any sort of specialized mine protection kit, which according to older sources was part of the Leopard 2RI at Eurosatory 2014. Aside of the addition of AMAP composite armor designed by the German company IBD, the Leopard 2RI also features electric turret drives instead of the previous hydraulic ones and an air-conditioning unit. The gun brakes have been improved, allowing the tank to fire the current generation of high-pressure APFSDS ammunition. The fire control system has been improved to allow firing programmable HE ammunition. Overall the Leopard 2RI should weigh slightly less than sixty metric tons, based on lacking a few features of the sixty tons Leopard 2 Evolution (IBD's armor testbed, on which Rheinmetall based it's Revolution tank). The Leopard 2RI was also presented at the Rheinmetall Land Forces Symposium 2016 in Germany. It was located next to the current version of the MBT Technologieträger, a testbed based on Rheinmetall's Leopard 2 Revolution. The MBT Technologieträger is showing what Rheinmetall currently can offer for a tank upgrade and is also used for testing new parts. 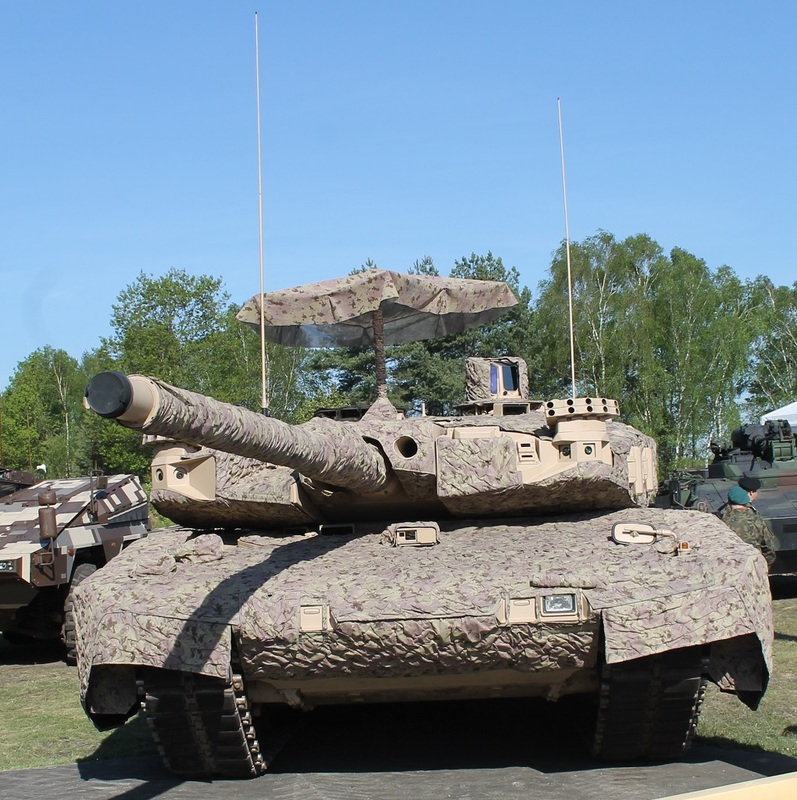 At the Land Forces Symposium 2016 the tank was shown for the first time with a thermal camouflage/cover - it is not exactly known if this is SAAB's Barracuda MCS, the current market leading product, or based on the AMAP-S thermal cover manufactured by Rheinmetall. An interesting change compared to the previous version of the Technologieträger is the missing remote weapon station. The MBT Technologieträger can show future upgrade options for the Leopard 2RI. Compared to it, Rheinmetall's demonstrator includes the longer-barreled L55 tank gun, superior optics with third general thermal imagers, the ROSY smoke screen system, the ADS active hardkill protection system, an APU and a 360° surveillance system with day and night sights.